Hey guys, Geno who is a reader of my Blog saw my post about how easy it is to start a Blog. Geno decided to give it a try and he has done a fine job. Everyone visit his Blog and say hi. Come on now, lets get some more woodworking blogs up and keep this hobby active on the web. Make sure to leave Geno a comment when you visit. I receive several nice emails from readers and I appreciate all the comments. I recently started getting pictures of scroll saw projects which is great. Here are a few that I wanted to share with everyone. If you have pictures of your woodworking projects you would like to share, send them to me and I'll be glad to post them for all to see. The Scrollsaw Workshop has readers in over 40 countries now with hundreds of page views daily. Let the world see your work. 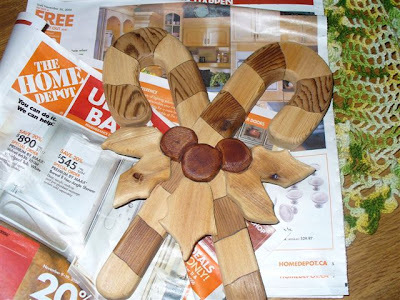 I found your site this week end and had a great time cutting out 2 of your baskets. I really enjoy the pattern. thank you very much and keep up the great work. 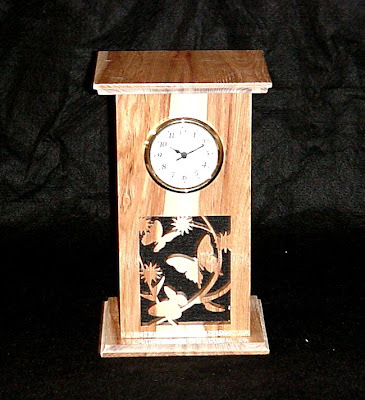 I made your tall clock with hickory(i didn't put the front piece on).. I still have to put the finish on the top and bottom(and glue them to the piece) and I also added a piece of black felt inside to highlight the butterflies.But I think it came out nice and was really easy to do. I have not started any projects yet, but I was thinking of doing that bowl that you did on your web page for a starter for this year . I live in Penticton B.C. Canada and this time of year there is always something going on, peach feast and Stuff like that. Last year I started doing intarsia because of a neighbor was doing it, and I thought it was neat . So I got a pattern from him and started doing it too. I made 5 to 6 of them , and not one of them did I keep for myself as all went to wards friends for Xmas and stuff like that . So I am going to Finnish one for myself then , I really like that bowl that you made so I think I will give it a try. My shop is really small, like one of those tin sheds that a person can buy at a hardware store , actually I not sure of the size but it must be 15 x 8 feet wide , not much bigger , not like your shop . I am sending a picture of some of the things I made last year. This is my first attempt .